The name of Charles Thomson is not as familiar today as it was in the early days of America when it was widely known and respected. Born in County Derry, Ireland, Thomson was one of the most influential men of the entire American Revolution. He served as Secretary of the Continental Congress for over 15 years (the entire life of that body) and was, in fact, the Chief Executive of the American Government several times between 1776 and 1789. During brief illnesses of the Congress Presidents and after John Hancock's resignation from the post in 1786, Thomson served as President, the highest office in the land. He penned the final draft of the Declaration of Independence and, as its congressional witness, was the first to read it both in Congress and publicly. He oversaw the first Presidential election and was the Congressional Delegate who offered the position to George Washington in 1789. As the only Secretary of the Continental Congress, his signature and seal are on all the new nation's official papers, and his minutes are the official history of the birth of the United States. Delegates to the Continental Congress came and went, but Thomson remained the only one to see, hear and record all of the deliberations and decisions, witnessing them from beginning to end as no other man did. John Jay, who became the first Chief Justice of the U.S. Supreme Court in 1789, wrote in a letter to Thomson six years earlier: I consider that no person in the world is so perfectly acquainted with the rise, conduct, and conclusion of the American Revolution, as yourself. Likewise, few equaled his knowledge of the politics of the time and his advice was often sought. President Washington later wrote to him, Posterity will find your name so honorably connected with the unification of such a multitude of astonishing facts . . . Your services have been as important, as your patriotism was distinguished. Ranked closely with the President, Thomson stands to the right of John Hancock in the painting of the Declaration of Independence seen on the two-dollar bill and his portrait was used on a 7-cent postcard issued in 1975 (see below). His role in the Declaration of Independence was equally significant. On July 1st, 1776, the Second Continental Congress met in Philadelphia and on July 2nd, 12 of the 13 colonies voted in favor of Richard Henry Lee's motion for independence. Congress President, John Hancock, and a committee consisting of Thomas Jefferson, Benjamin Franklin, John Adams, Robert Livingston and Roger Sherman, composed the copy of a declaration which was presented to the Congress on July 4th. As Congress debated and revised the text, it was edited by Charles Thomson. The document was finally approved on July 4, making it the first ‘official’ copy of the Declaration of Independence and it was signed by Hancock and Thomson. It was then taken to be printed as a ‘broadside’ by John Dunlap of County Tyrone, official printer to the Continental Congress, in his Philadelphia shop that night. On the morning of July 5, copies were sent to members of Congress, various assemblies, conventions, and committees, as well as to the commanders of Continental troops. It is unknown exactly how many broadsides were printed, but the number is estimated at about 200. John Hancock's eventually famous signature was not on the broadside version of the document, his name appeared in large type under the words: Signed by Order and in Behalf of the Congress, John Hancock, President. Attest. Charles Thomson, Secretary making Hancock's and Thomson's the only two names on the first copy of the Declaration of Independence which was printed that night of July 4th, 1776. The Declaration of Independence was not signed by all delegates on July 4th. It was not until August 2nd, one month after the motion for independence had been passed, that 56 delegates of the Second Continental Congress at the Pennsylvania State House (Independence Hall) in Philadelphia, representing the 13 self-declared ‘united states of America’, signed the Declaration of Independence that they had finally approved on July 4th. Thomson, a man of principle, also took the radical position at the time of referring to slavery as “a cancer we must get rid of. It is a blot on our character that must be wiped out,” he said. However, though few know this great man’s name today, his most symbolic contribution still exists among the most recognizable icons in the world. On the day that the Declaration of Independence was first adopted, Benjamin Franklin, Thomas Jefferson, and John Adams were appointed as a committee to design an official seal for the new nation. That committee and two succeeding committees failed to agree on an acceptable design. After six years of fruitless effort, the task was turned over to Secretary Thomson. He designed both sides of the seal in less than a week and had it ready for Congressional approval in June 1782. It was unanimously adopted and has never been changed! 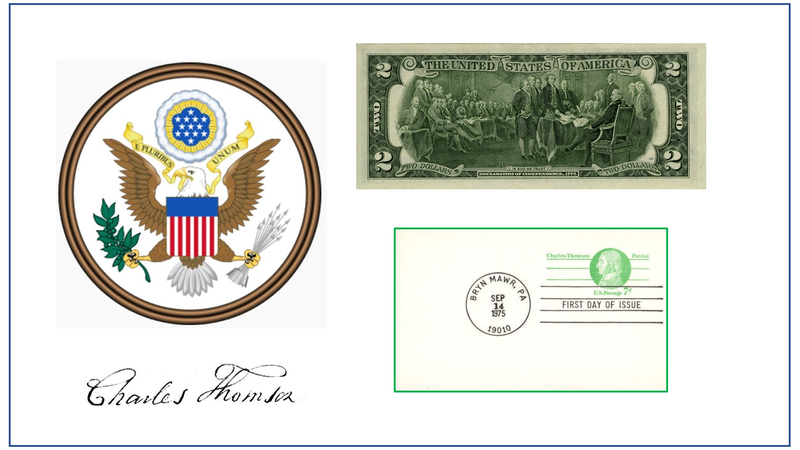 The Great Seal of the United States that is displayed on a variety of items from the President’s jet airplane to the one-dollar bill you likely have in your pocket is the legacy of Charles Thomson—another of the Irish who helped to shape America. This story was created by Mike McCormack, AOH National Historian.